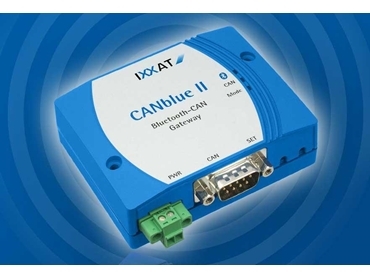 IXXAT presents the new CANblue II/Generic to offer an intelligent CAN/Bluetooth module providing bridge as well as gateway operation modes. CANblue II/Generic enables easy access to the CAN network via a wireless connection using a laptop or handheld service device, allowing data and parameters within electric facilities and mobile systems to be read or configured wirelessly without having to directly intervene in the existing network. The Bluetooth communication is performed using simple ASCII commands and CAN-optimised binary messages, allowing the device to be accessed via ‘non-Windows’ systems or embedded platforms. Featuring a compact and rugged design, the CANblue II/Generic device can be easily integrated into existing systems, and also comes with an integrated antenna and mounting holes. Its wide supply voltage range, galvanic coupling and extended temperature range allow use in a variety of applications. Different CAN networks can be easily and wirelessly linked with each other by coupling several CANblue II/Generic devices. This is particularly relevant to systems with mobile components or rotating parts that need to be linked by using fault-prone slip ring connections. The message exchange is performed transparently, enabling the use of CANopen and DeviceNet as well as customer-specific protocols. IXXAT Automation GmbH is a leading expert in data communication technologies for embedded systems. IXXAT products are available in Australia through CAN Automotion .